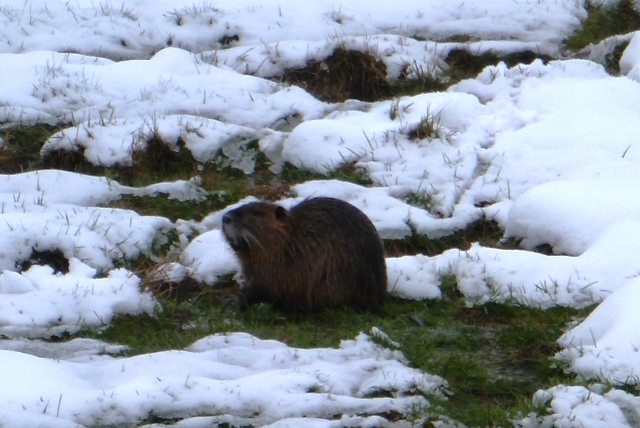 We stumbled across these little critters whilst out for a walk in the snow at the weekend, and I have to admit that, until we got home and enlarged the photographs, we thought that they were beavers (Castor). 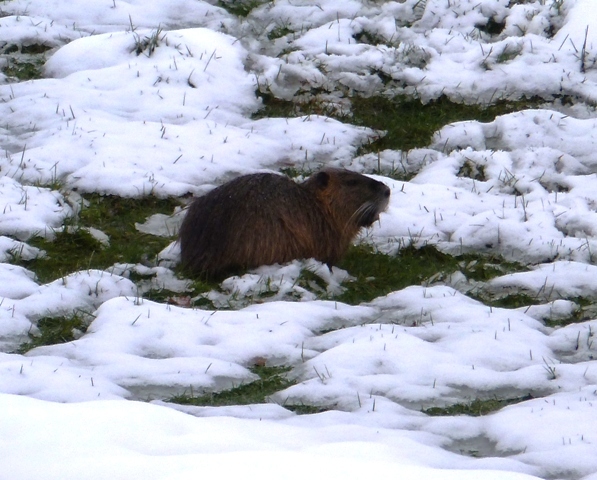 Coypu are large, semi aquatic rodents and are quite common throughout France. 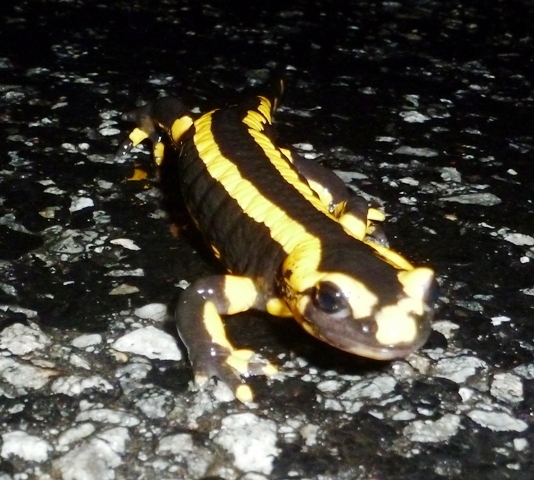 They can grow up to 70cm long and weigh between 5-9kg. The Coypu have webbed hind feet and large, bright orange coloured incisor teeth. The tail of the Coypu is slender, long and rat like. Coypu originate from South America and were introduced into France during the 19th Century where they were bred for their fur, which is a dark reddish-brown colour with a velvety grey under fur. Many Coypu escaped from these fur farms but others were simply released into the wild when the fur trade declined. Although they look lovely, Coypu are now seen as a pest in France due to the destruction they cause to the very river banks they feed along. The large burrows they live in and the sheer amount of vegetation they eat, can lead to the destruction of marshes and therefore the displacement of other native wildlife. French farmers in particular are not fond of Ragondin as they tend to enjoy their crops too! Coypu are very prolific breeders, and can have up to 3 litters in a year, with as many as 13 babies per litter! As a result of their destructive ways, many local authorities in France have schemes underway to eradicate Coypu, but I’m a softee, so my lips are sealed as to where exactly these ones are living. Great photos and information. You mention that French farmers are unhappy with the destruction these animals are causing? They should themselves look a little closer to home as according to the AAPPMA (l’Association Agréée pour la Pêche et la Protection du Milieu Aquatique) cattle are destroying and poluting streams and rivers an an alarming rate which in turn is having a catastrophic effect on fish and other aquatic life as well as other animals and birds that live and feed in and around these areas. The reports seem to fall on deaf ears with the farming community, but if no action is taken soon the problem could become irreversible. 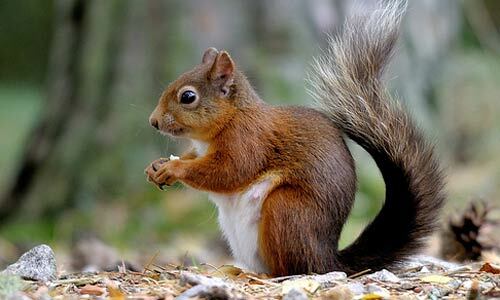 Hi, my goodness, I guess there are so many different things which affect our wildlife that you just don’t realise. Thanks for sharing, it certainly makes you think.